Slept fitfully ... some hallway noise late at night, but mostly I was just feeling antsy and wanted to keep moving. The plan was to go to the airport -- returning our trolley, ha ha. Check in for our flight, drop off the bags, clear security, then have breakfast at FRESHII. If we could find it. Check in was pretty easy -- we were early and didn't have to wait in a line. Say goodbye to the bags! Getting through security was a reminder of how glad we are to have TSA Pre-check. A slow-moving line, weird fellow travelers. (Seriously, dude, don't set your bag down and then wait to pick it up when you snaked back around to it. You made everyone really nervous.) 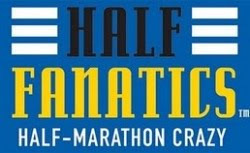 And having to take off shoes, take out liquids, and take out electronics. But we made it. Sadly, the international terminal isn't where the Freshii is. And I really didn't want to have to hit security again, so we just wandered around looking for something appetizing. The restaurants were all cool and stylish and weirdly empty ... and we sidled up to an iPad and perused a few menus and ordered a bit of unremarkable breakfast. Amusing event: the restrooms at YYZ are set up with a big opening that splits into two: Men and Women. Wil was in a stall in the men's, when he heard a woman yelling at men who walked in. This continued until Wil left the stall and the two of them made eye contact. With a lingering look at the urinals, which should have been her first clue, she stopped and rushed out. Outside Wil and another "victim" laughed about it all. 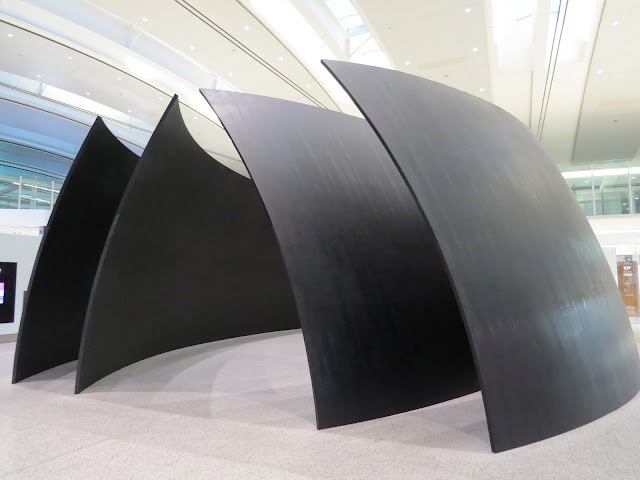 The nicest thing about Toronto's Terminal 1 -- or at least the most remarkable -- is Richard Serra's "Tilted Spheres". Apparently constructed before the terminal itself (so that it would fit), Tilted Spheres consists of four huge steel fins, 39 feet long x 14 feet high, each curved, torqued, and coated in black rust inhibitor. The curves create echoes and seem to amplify whispers if you stand in the right space. 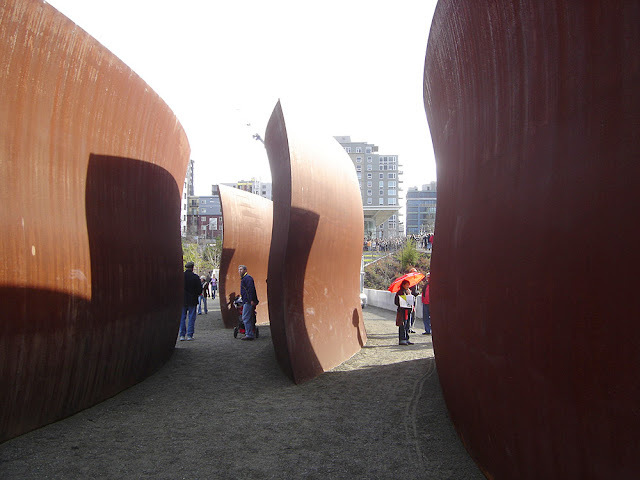 Seattle has its own Richard Serra installation, and you don't need an international plane ticket to experience it: "Wave" is at the Seattle Art Museum's Olympic Sculpture Park. The towering, curved steel forms of Wake were achieved with computer imaging and machines that manufacture ship hulls, including a demilitarized machine that once made French nuclear submarines. It is composed of five identical modules, each with two S-shaped sections positioned in inverted relation to one another—gently curving serpentines of convex and concave parts that suggest tidal waves or profiles of battleships. The surface of acid-washed, weather-proof steel reinforces this industrial effect. Wake's powerful silhouette belies a complex configuration of parts: the whole cannot be known at once, only experienced with physical movement and progressively over time. Or, as Serra himself said, "What's important is you moving between them, through them, and around them as they undulate; it's your body moving in relation to their surface that moves." Our vegetarian meals arrived without a hitch -- surprisingly spicy, yet not particularly distinct between "dinner" and "breakfast". But I'll take a veggie curry over rubbery chicken any day! I will say that the carrot in the main course had been somehow magically steamed to essentially a "mash" consistency ... but maintained its shape ... almost as if it had been piped there. Very, very odd. And yet tasty. Not a lot of sleep was had -- but we survived the 14-hour flight and arrived in Addis Ababa. We stepped off the shiny new 787 Dreamliner (lush!) -- my first -- onto a stairway, which always makes me go full "Nixon", much to everyone else's alarm. The morning was pleasantly cool -- after all, it was only 7:30am -- but the air had the distinct smell of coal smoke. Addis Ababa Airport is, in some ways, less bad than I'd feared. Yes, it's crowded, but we had no trouble finding a quiet place to sit. 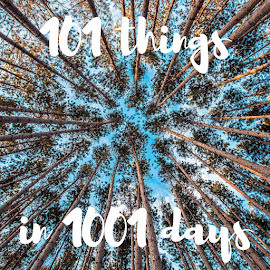 Okay, quiet is overstating it -- but we were out of the way. We somehow were deposited in the departure lounge, inside security, which is devoid of anything -- apart from benches and toilets and gates. No food, no shops, no joy. We considered trying to go out into the non-secure area -- tantalizingly close and visible through a glass wall -- but there was a queue and it felt odd. Plus we had no useful currency. So we just sat in the joyless lounge, watching plane after plane land and take off. Clearly this is a very busy place! When we were nearing boarding time, we moved closer to our gate and were amused by the number of hiking boots and daypacks. A lot of people looked like they were preparing to climb Kili! Then we boarded our final flight -- Addis Ababa to Kilimanjaro. The flight was pleasantly short and empty, and our "snack" turned out to be, you guessed it, more curry. We hoped to spot Kili from the air, but had no luck. Kilimanjaro Airport is perfect and small. As we already had visas, our immigration process was reasonably simple, if slightly confusing since someone from Zara met us at the airport and handed us pre-filled immigration forms with the wrong hotel name on it. Also, we were lucky that we knew that Erik was arriving on our flight, and that we knew his last name, since the sign read "Mr. Rasmussen +2". Soon we had new stamps in our passports and our bags and we headed out to a waiting van. We were joined by Yesse, our head guide, and an old friend of Erik's, for the trip to Moshi. On the way out of the airport we hit a traffic jam: a herd of cows crossing the road. #TIA -- this is Africa. I was impressed by how smooth the driving was -- I had expected breakneck speeds and swerving drivers, but nope. The roughest part was the final stretch from Moshi out to the hotel, where we had to go over several massive speed bumps. The driver, clearly familiar with this road, had different strategies for the different bumps. Some he was able to go around by pulling off the road. Others he took at an angle, causing the van to rock back and forth. And some he just inched straight over. But for all of them, they served their purpose: we slowed waaaaay down. We made a stop in Moshi so Erik could buy a local SIM card. 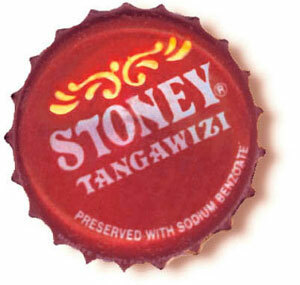 Wil and I headed into a nearby grocery store and picked up bottles of water and some Stoney Tangawizi -- our first proper African Stoney. Hooray! We got to the Springlands Hotel, checked in, and got settled into room 43. The hotel is nice -- not fancy, but clean and with lush gardens and plenty of places to gather. There's even a surprisingly large pool, a bar with garden seating, a small shop, and an open-air restaurant. Everything you need. We said hello to Jenny, our fearless leader, then had lunch and a swim... and tried desperately to stay awake until after dinner. We went for a little walk -- drawing raised eyebrows from the staff, especially the guard at the gate. I think it's one of those things... is the security (a manned gate, high walls) to keep people out, or keep people in? Or just to make the tourists feel more secure? But we stepped out and onto the road as children were heading home from school. Lots of friendly greens and smiles and mild astonishment. We walked toward the rice fields, saying "Jambo!" and waving. Then we turned back toward the hotel and ... BAM. KILI. She was so lovely we could barely believe it. We took a few pictures, and then hurried back inside to get Jenny so she could see the mountain. She grabbed her camera and joined us outside of the gate -- we were all a little stunned by the sheer size of Kilimanjaro. Umm, we're going to climb THAT?!?! We managed to stay up through dinner -- barely -- and then collapsed into bed under our mosquito nets. We're off on our African Adventure!